Week 22 - Boost Your Energy with Vitamin B-12! Vitamin B-12 is the most chemically complex of all the vitamins and is vital to many of the body's most important functions. This includes the formation of red blood cells, the utilization of iron, proper digestion, and absorption of food. It also aids in cell formation, cellular longevity, prevents nerve damage, and aids in the formation of of the fatty sheaths that cover and protect nerve endings. Research shows that adequate levels of B-12 can aid in the prevention of Parkinson's Disease, Alzheimer's Disease, and also shows great promise in the treatment of multiple sclerosis and other neurological diseases. With its crucial role in maintaining nerve health, it is easy to see why a deficiency in this vitamin might lead to some of these devastating neurological illnesses. Sources of vitamin B-12 in your diet are found almost exclusively in animal tissue. This includes meats, seafood, milk and dairy products, eggs, and brewer's yeast. Good sources also include clams, herring, kidney, liver, and mackerel. Unfortunately, many of these sources today have less than adequate levels due to depleted soils, lack of nutrients in the animal's own food source, and the commercial raising of livestock and fish-farming. When you ingest these animal proteins, your stomach acids must break the B-12 away from the protein itself in order to be absorbed into the blood stream. As we age, our stomachs tend to secrete far less of these acids, and oftentimes the B-12 passes right through your system with very little absorption. So you may think you're eating a diet rich in B-12 and actually still be low on this crucial vitamin! Fortunately, determining whether or not you are deficient is as simple as getting a blood test. You can request this test from your family doctor to determine whether or not your levels are adequate. If they are indeed low, the good news is you can correct this deficiency by taking a high-quality B-12 supplement. 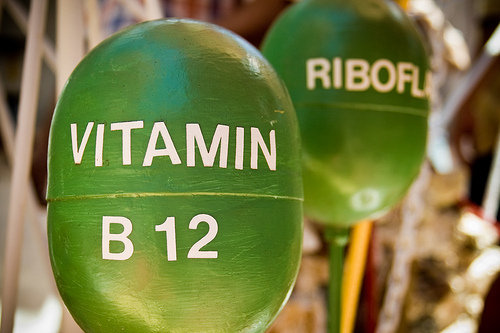 When choosing a supplement, be especially aware of the type of B-12 you are purchasing. B-12 comes in two forms: methylcobalamin and cyanocobalimin. Of the two, methylcobalamin is much more absorbable by the body and thus can be more easily converted to assist in vital metabolic functions. Cyanocobalamin is easier to manufacture, thus costs less and unfortunately is the form found in many over-the-counter B-12 supplements. The very best form is a sublingual or chewable one that contains methycobalamin. This is the most highly absorbable form and should be taken on an empty stomach. Vitamin B-12 injections are also available with a prescription and may be necessary for those who are super-low in this vitamin. It is not necessary to be tested before you begin a B-12 supplement as studies show, and experts agree, there really is no such thing as "taking too much." A good starting dose is somewhere around 1,000-2,000 micrograms (not milligrams!) two to three times per day. This week, your task is to shop for a high-quality B-12 supplement containing methylcobalamin. Your B-12 supplement should be in addition to any regular B-complex supplement you are taking even if it already contains B-12 (these usually contain far less than the amount needed for optimal health). Start this super-vitamin today and watch your energy soar!